A Sioux City native who is president of the union that represents thousands of workers in the executive branch of state government says he learned the value of unions from his father. Danny Homan is president of AFSCME Council 61, the union which represents about 40,000 people who work in state, county and municipal governments throughout the state. Homan’s been in the spotlight this month, as 9,000 members in his union have been given an opportunity to vote on an “understanding.” It’d mean state executive branch employees take five unpaid days off in order to save 479 union jobs. Homan plans to announce the results of that vote on November 30th. “I’ll probably be in (the AFSCME state office in Des Moines) on Saturday or Sunday and tally up the tally sheets and we’ll make the announcement on Monday,” Homan says. Homan didn’t take a public stand on the deal, and isn’t predicting which way he thinks the vote may go. “This vote is about one thing and one thing only: letting the membership of this union have a say in their own destiny,” Homan says. During a news conference earlier this month, Homan spoke emotionally about his start with the state and the workers who face layoff notices. Back in 1984, Homan was hired to work at the state’s residential treatment facility in Sioux City and in 1985 Homan led an effort to start a union local in his workplace. 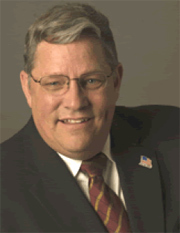 Homan rose through the AFSCME ranks and in July of 2005 he was elected president of AFSCME Iowa Council 61, the top state official in the union. Homan grew up in a union family. Homan’s father was a member of the Teamsters Union, driving short-haul routes in the Sioux City area. The roots of the AFSCME union date back to the Great Depression and a group of white collar state workers in Wisconsin who formed a union in their workplace.